Now on to probably the most overlooked member of The Justus League, Median. He has only dropped one album, Median's Relief, and that is the project that I will be reviewing here. Of all the albums and mixtapes I've reviewed from The Justus League thus far, Median's Relief may very well be the most enjoyable. Why? Because the production is resolutely phenomenal. 9th Wonder and Khrysis both dropped some joints for the album, but the other producers who worked with Median also put down some heat. This may sound strange, but Median's delivery reminds me of a young Eminem, and that will probably appeal to a significant portion of listeners, as Em is obviously one of the most popular rappers out. His subject matter, though, differs entirely, as, like Skyzoo, he touches on issues that we all have to deal with, and the soulful, relaxing production suits said content perfectly. The album gets off to a great start, as a producer by the name of Koen drops a very solid beat for Median who raps about an unfaithful girlfriend who he just can't seem to let go. An R&B artist appropriately named Real Love does an incredible job with the hook and even drops a nice, short verse of his own, and Median simply cruises on this: "Love makes everything so vibrant and so bright, who cares if I'm blind by the light." Really, really good cut here. The beat here (produced by Zo!) isn't as good as the one on "Love Again," but it isn't bad, possessing a nice drumline and upbeat tone. As can be derived from the title, Median spends this track inserting himself into different similies (ex: "Love me like the first crush in your life, trust in me like husband does wife."). I think it's actually a pretty neat concept. 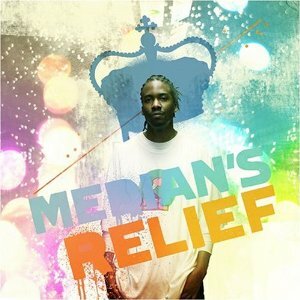 Welcome to Median's Relief, 9th Wonder. 9th lays down an extremely nice beat for Median here, and Median effortlessly flows over it and sounds great in doing so. This album has certainly gotten off to a heck of a start. The second consecutive 9th Wonder beat, and it's the worst beat on the album thus far. Also, for some reason, Median decides to spend the first part of this song talking about his morning routine, including taking a shower. Um...okay? Khrysis makes his first appearance on Median's Relief here, and he drops some heat. The sample he uses is sick, and the hats and snares are placed perfectly throughout this cut. Female singer Ladehra aids Median on the terrific hook, and Median drops some great lines to boot, including: "The J-League name is growing like your puberty." All-around outstanding record. 6. What Would You Do? Some dude named Ant B lays down this track for Median, and he does an admirable job, inserting some nice kick drums and consistent hats. The only thing that bothers me a bit is that the vocal sample overpowers Median's voice whenever it surfaces, which is unfortunately quite often. Nicolay gets his first of back-to-back productions here, and the one that succeeds this is clearly superior. There really is nothing special about this track, although Median does rap a nice hook. This time, Nicolay does his thing, as this beat is very good. The song, the idea of which was obviously taken from 2Pac's "Brenda's Got a Baby," is almost six minutes long, but it's damn good and, in terms of content, is the album's best track (it isn't my personal favorite, but the format is just genius). Median does a fantastic job with storytelling while also staying masterfully consistent with his flow. You really have to listen to this track a couple of times to truly appreciate how great it is. A producer dubbed Centric drops this beat for Median, who spits: "Something about the glory of the story make it interesting, what a woah-feeling, vicarious experience." The production, while smooth, is pretty bland, forcing Median to carry this track. It's alright, but it's not one of my favorite tracks off Median's Relief. 9th Wonder returns to lay out the beat for "Choices," and he comes through in a big way, as this knocks. Chaundon and Joe Scudda each drop verses here, and of course, my bias toward Chaundon is just coercing me to write some parts of his verse: "I choose to be a marquee artist, rhyme the hardest, wizard with the wordplay, this power I harness, anointed me the chosen one, born with a crown on, bless you with a 16 with 9th Wonder sounds on." Whewww. Scudda rips his part, too. 11. How Big Is Your World? Aside from "Personified," 9th Wonder was consistently impressive on this album, here putting down a solid, choppy-in-a-good-way beat for Median on "How Big Is Your World?" On the track, Median talks about his split personality, "Moody," and how it controls some of the decisions he makes in his life. Overall, the record fosters a good message, as Median ends the cut saying that he will continue to grind to get him and his mother out of the struggle. This is another Nicolay production, and like "Powershift," it's smooth, but it's fairly boring. Remember when I said Median flowed like a young Eminem earlier? Well, he really sounds like him on this track, as his delivery actually mirrors that of Em on his famous song, "Stan." Mark Wells, an R&B artist, drops the hook. "Strides" is nothing more than mediocre. C. Keen puts down this beat for Median, using the same sample that was used on Xzibit's song, "Family Values." This is, in my opinion, the best beat on Median's Relief, and, consequently, my favorite song on the album. It has an incredibly feel-good vibe to it, and it's the type of track that you can easily cruise to in your ride. "I love to get results, that's why I like pain, and love the slow grind, like even in the rain," spits an upbeat Median. This is a Khrysis remix of L.E.G.A.C.Y. 's track off Project Mayhem, which was produced by 9th Wonder. Wholly, though, the original and the remix are entirely different tracks, as the original consisted of L.E.G.A.C.Y. rapping by himself while the remix contains verses from Median, L.E.G.A.C.Y., and Spectac, plus a hook from Edgar Allen Floe (which is the best part of the record). The production here is pretty meh. Another Khrysis remix. This is no better than the original that 9th made. The original was produced by 9th Wonder, but this remixed version which was produced by Koen, who also produced this album's opener, "Love Again," is a heck of a lot better. Koen puts together a great drumline here which really makes this cut. This is another one of Median's Relief's upbeat numbers. To put it plainly, Median's Relief is a great album. Median is a heck of an MC, and he has an outstanding ear for beats. Even some of the lesser known (I should really say unknown) producers on this record come through with some sick beats for The Justus League rapper, making Median's Relief a satisfactory listen from front-to-back. Whenever the stars align for Median to put out another album, I will be one of the first listeners. This dude clearly has otherworldly potential as an artist. What is most impressive about Median is his steady flow; his breath control is outstanding and he is able to maintain that throughout the entire album. After listening to and reviewing L.E.G.A.C.Y. 's down-in-the-dumps Project Mayhem, Median's Relief was a breath of fresh air, as nearly all of its tracks possess a buoyant vibe that are suitable for any situation. It's really hard to point out any negatives on this project, as it doesn't even have any tracks that are poor enough for me to recommend skipping. If I were you, I'd listen to this pronto.